In addition to adding users, you may want to create a few groups. Groups are simply a collection of users. 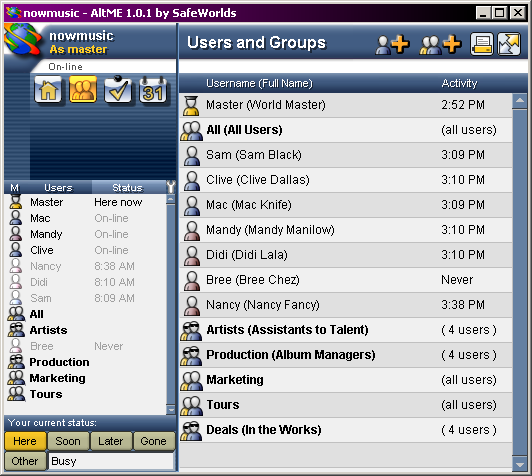 A group can include one user, several users, or all users. To share messages and other information with more than one user, you must create a group. A group may be permanent or temporary. The difference is just in how you decide to use the group. 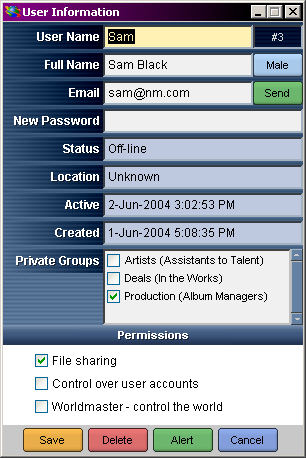 For example, you may create a permanent group for your "web site" or "artists". But, you may also create a temporary group for holding an on-line meeting on a specific day, then delete the group once you have finished using it. Only the worldmaster can create and delete users, but any user can create, change, and delete groups. Only the worldmaster can create new users. to open the users and groups application. or you could click on a blank line in the user list. The only required fields are the user name and password. In addition to a user name, it can be useful to include the user's full name and an email address. This information can only be viewed by other users in your world. No one else on the Internet can see it, not even us at SafeWorlds, Inc.
You can add the user to various groups now if you want. Or you can add the user later. Keep the default permissions, unless you want to give another user power to control your World. Within seconds you will see the new username appear in your users and groups list. Once a user is created, the user is permitted to change their own full name, email address, and password. However, the user cannot change their username, only the worldmaster is allowed to do that. To change user information, right click on the user's name in the main window and the User Information window will open. Only the worldmaster can delete users. To delete a user, right click on the user name in the main window. If you delete a user, all of that user's private messages and other information will be deleted from the system. Even if you add back the user later under the same name, the older messages will be lost. Why is this done? Because you may have deleted one Bob then added a new Bob. The new Bob should not get the old Bob's messages. If you want to temporarily suspend a user from using the system see the section later in this chapter. Any user can create a new group. 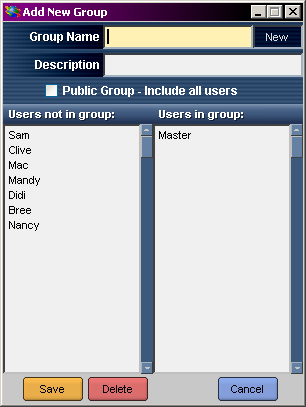 Groups can be public or private; you can decide what users are part of a group. If a user is not part of a group, the group will be hidden from them. They will not see the group name appear on their user and group list. worldmasters, however, can see all groups. Decide what users you want to be part of the group. Click on All for all users or click on individual user names to add them to the group. You can also add or remove users later as needed. Within seconds you will see the new group appear in your users and groups list. 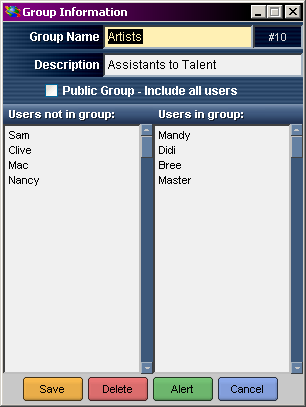 To change information about a group or what users are part of the group, right click on the group name in the main window. Anyone can delete a group. To delete a group, right click on the group name in the main window. If you delete a group, all of that group's messages and other information will be deleted from the system. Even if you add back the group later, the older messages will be lost. A user is allowed to change their password, and the worldmaster can change any user's password. To change a password, right click on the user's name in the main window. You will be asked to confirm the password to make sure that you did not mistype it. The worldmaster might suspend a user for any number of various reasons, such as abusive behavior. To suspend, but not delete, a user the worldmaster can simply change the user's password. If the worldmaster wants to indicate that the user has been suspended, he can also change the user's name temporarily, such as putting a dash (-) in front of the name or some other type of indication. You can give other users worldmaster capability. This allows other users to create and delete users, as well as see the list of all groups on the system. Giving worldmaster capability to another user should be done only if you completely trust the other user. A worldmaster has complete control over a world, including creating and deleting users. 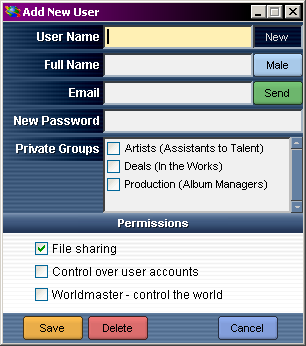 The new worldmaster can even delete your worldmaster capabilities or your entire user account. CTRL-N Create a new user. CTRL-S Save changes to a user or a group. ESCAPE Close user or group information window.